Point of care testing (PoCT) is the provision of diagnostic testing provided at, or near the patient bedside, (i.e point of care). Test results are immediately available to enable urgent medical decision making. Point of care testing (PoCT) is now widely recognised as contributing to better healthcare by significantly reducing turnaround time for pathology testing. In late 2010, Monash Medical Centre was the first hospital in Victoria to employ a full time Point of Care Co-ordinator to manage the current point of care analysers as well as co-ordinate and assist with the increasing demand for the implementation of new point of care tests. The role of the co-ordinator is to ensure the technology is used safely and effectively in a quality framework as well as train the large number of non-laboratory healthcare workers to use PoCT instruments. Laboratory trials are carried out to ensure the point of care device is ‘fit for purpose’. In mid 2011 PoCT for a rapid chest pain pathway in our three Emergency Departments was implemented resulting in faster diagnosis of a heart attack allowing treatment to start earlier. 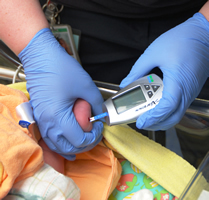 New glucose meters have been introduced to the neonatal units with improved accuracy and speed. These meters have now been rolled out in all wards at Monash Medical Centre improving the treatment of the many diabetic patients across all Monash Health sites. New lactate meters were introduced in 2014 in Birth Suite assisting in rapid decision making for babies at risk and may require emergency caesarean delivery. The coagulation (INR) meters have been upgraded and increased in number to assist Hospital In The Home as well as enabling some children to be monitored without the need for a venous blood collection. Most PoCT meters only require a drop of blood from a finger prick. Theatre also now have coagulation instruments assisting with decision making regarding the efficient use of blood products. The next project about to be undertaken is Creatinine testing in the Radiology Departments. This is required to check the kidney function before contrast radiological dyes are given to a patient undergoing a computed tomography (CT) scan. The future of Point of care testing at Monash Health will include connecting point of care instrumentation to central laboratory and hospital interfaces. This will facilitate results being available in real time for prompt access by clinicians as we work to improve outcomes in patient care.